Magnus von Levetzow joined the navy in 1889 and during the First World War he was in command of several operations at sea. In 1917 he received the (German) Orde pour le Mérite. After the war he was in command of the navy station in Kiel. He was forced to leave the navy in 1920 after he supported the putsch by Wolfgang Kapp that failed. In Kiel he had tried to silence the leftish press, but a general strike prevented this. When the troops no longer supported him he resigned and he was arrested. Around 1930 he met Adolf Hitler and in 1932 he became a member of the Reichstag for Hitler's NSDAP. After the nazis came to power in 1933 he was made chief of the Berlin police, but in 1935 he was fired after disagreements with the nazis. In his last years he was in command of the Berlin branch of Weser-Flugzeugbau. 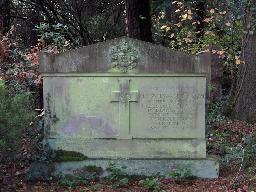 The grave of Magnus von Levetzow at the Südwestfriedhof, Stahnsdorf, Berlin.